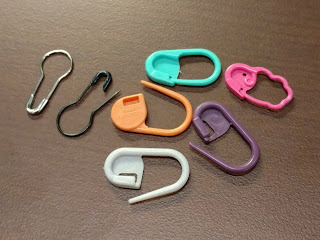 Before I move on to the next part of the mitten I want to talk to you about stitch markers. It is important to use the type that open and close like a safety pin. I have several types pictured below. I don't like to use the ones that just have an opening in the ring with no closure as they tend to fall out. And, obviously, we don't want to use the closed ring type as they will be a permanent part of your work once you put them in. Pictured above are Boye, Clover, Knitpicks brands and some bulb pins. Now, moving on to the mittens. 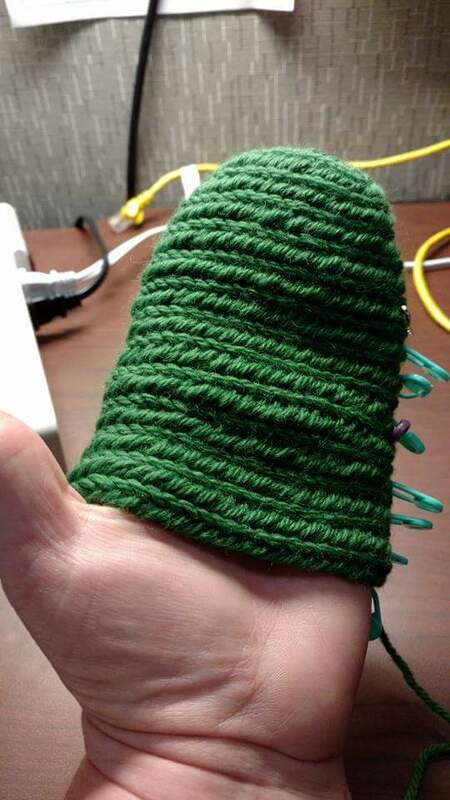 Once you have your mitten caps the size as you need them just continue connecting rounds without increasing until you have the length you need to reach the thumb. I forgot to mention in my previous post that when I make a pair of something I make both at the same time. In this way I can keep them the same. I continued working the first set of rounds in the vein of stitch 1, make 1 on either end with a repeat on the other side so that I eventually ended up with what looked like a small cap now with a total of 52 stitches in the round. Basically I was increasing by 4 stitches on each round until the desired number was reached. 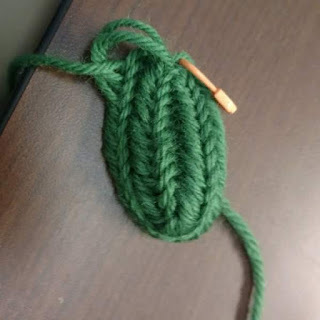 I repeated that with another chain of stitches so that I had two small caps. By the way, the needle is made from bone and was purchased from Egil's Woodstuffs at Gulf Wars this last year. Back in October several ladies from our Kingdom (Meridies) held a silent auction at Coronation with the proceeds going to help hurricane victims. I donated two certificates for a pair each of naalbound mittens done in the color or colors of the persons choice. I have been slowly working on these mittens and present the progress of the first pair here. 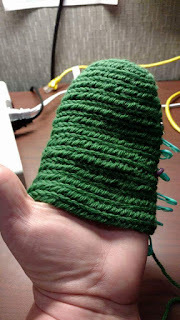 The material used is worsted weight wool in grass green color. Using the Finnish (2+2+2) stitch I chained 14 stitches. I then started attaching new stitches to the previous ones thusly: Stitch 1 , Make 1 new stitch, stitch 12, Make 1 new stitch, stitch 1 and then repeated as I went around the chain attaching new stitches to the previous row (round). I ended up with 32 stitches in this beginning round for a mitten top. See the photo below. A make one is the same in naalbinding as in knitting or crocheting. You simply stitch again in the just used joining stitch from the previous row. Greetings everyone. The holidays are almost upon us so I would like to take this time to wish everyone a Happy Holiday season. A lot has been happening this year. Our kids and grandkids moved out this year and we have been slowly making some much needed repairs and renovations to the house. I am hoping my office/workroom will be usable soon as I am ready to really work on some projects and research soon. Our construction supervisor hard at work. Let's cross our fingers and hope to get back to work on projects soon. Well, it looks like I fell behind on my Artsy Challenge posts, so let’s see if I can catch up. Worked some more on the blue knitted shawl. Ended up ripping it apart as I didn’t like the way it was going. Playing with patterns, not really my forte. This day I wasn’t really working on anything other than trying to get all of my supplies for doing Artsy things in order. I spent some time doing some naalbinding in the car as we were going to and from different places. 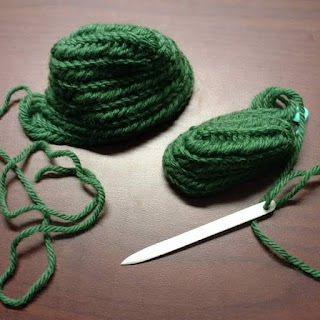 Can we just say it is frustrating when you are trying to join on a new length of yarn and instead of joining onto the working yarn on the item you join the ends of the new length together. I even joined them so well I couldn’t find the join to take it apart and try again. Yay me! Boo! Other than rearranging my livingroom I spent time working on knitting an ear warmer headband from wool. Nice brown wool. Today’s Artsy project was working on a blue knitted headband. This day’s Artsy efforts involved getting a pattern ready for an undersmock for my Viking outfit. Wow! Look at the time, surely I didn’t just spend 2-1/2 hours on this. 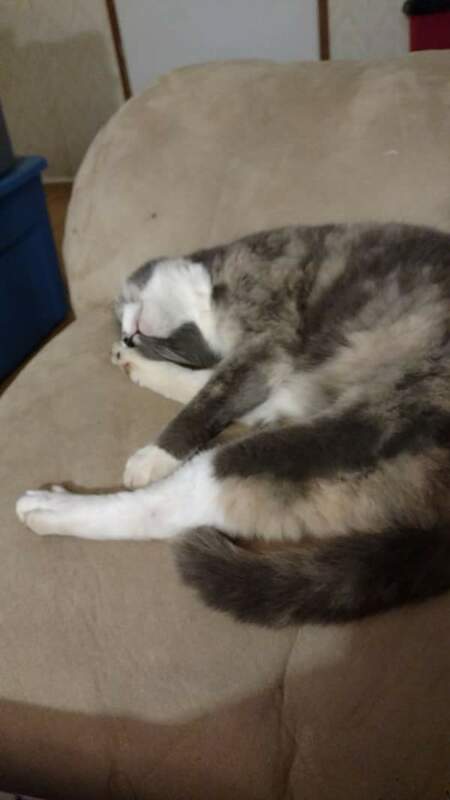 I thought I had only been working for about an hour. My effort here was on cutting out and sewing together the undersmock from some cream colored linen in a medium weight. I have to make some adjustments to it as the armscye holes are a little too large due to the shoulders being too wide. Luckily this is just a bit of a take in.